Vala is an eleven year old Paint Morgan cross mare. 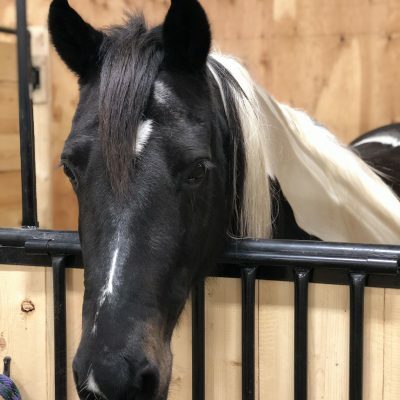 She stands at 15.2 hh tall and is black and white. Vala has been in the PARDS program since June of 2016 and is leased to us from Crystal Gilbertson. Vala’s wide build, combined with her height make her suitable for some of our taller riders and her smooth rhythmic walk and trot can make nervous riders feel more comfortable. Vala is a very sweet mare who is great for beginner riders who are learning to be more independent.